DESCRIPTION: 20 Amp 250 Volt, NEMA Configuration L6-20R, Number of Poles 2, Number of Wires 3, Amps 20, Voltage 250, Twist Type Locking, Color Black And White. 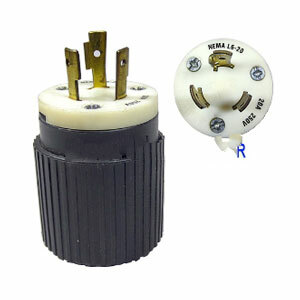 L6-20C (NEMA L6-20R), UL LISTED HEAVY DUTY 20 AMP 250 VAC, 2-POLE, 3-WIRE, FEMALE TWIST TYPE LOCKING PLUG. PRICE/EACH.